GRAND RAPIDS, Mich. (WOOD) — Health officials have confirmed a case of measles involving a person who visited Kent County. It comes amid an outbreak in southeast Michigan. Of the 43 cases reported, nearly all have been in Oakland County. "This is not an exposure that's putting all of Kent County at risk. It's just putting those people who were at those locations during those identified times at risk for exposure," Brian Hartl of the Kent County Health Department said. "Our main thing is to get information to people to make sure if they're at high risk for measles and were exposed in one of these environments that they keep an eye out for symptoms." The manager at the Baymont told 24 Hour News 8 the man sat inthe lobby for a short time before leaving without spending the night. The only other people in the room at the tim were a couple of employees who have so far not shown any symptoms. State health officials are urging people to get immunized, saying the vaccine is safe. They say a single a dose can protect about 95% of children and two doses protect nearly 100%. Across the country, there are some 555 cases of measles, the majority of them in New York state. The Michigan outbreak has been traced back to a man from New York who traveled to Michigan without knowing he was contagious. Vaccines are the first line of defense for local school districts. Before kids can start kindergarten, they need their shots. “My number one priority for our students in Rockford Public Schools is safety," said Mike Shibler, superintendent of Rockford Public Schools. Shibler says his district and others require all students to have all their vaccines before enrollment, and then again before they start high school. 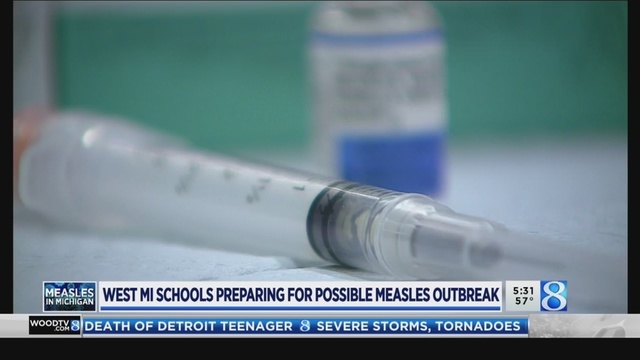 School officials will consider making an exception for that requirement if it’s due to medical issues, religious or philosophical reasons or if a student is partially immunized and waiting on the second dose. If the exception is for religious reasons, parents are required to meet with the health department. "They must have a form signed by the Kent County Health Department that they have had an opportunity to be educated about the pros and cons of being immunized,” Shibler said. Shibler said he is aware of a small number of students who are not vaccinated, primarily for medical reasons. If there was a chickenpox or measles outbreak, Shibler says he would ask unvaccinated students not to be in class. The return of measles is giving a scare to some Michigan parents, particularly those with babies because infants can’t be vaccinated until their first birthday. Andrea Finnigan is a first-time mom to 5-month-old Teagan, who is too young to be vaccinated. “I'm a little bit nervous about this measles thing going on in Michigan," Finnigan said. “As a parent, my first reaction was what can I do to protect my baby?" Finnigan says she is keeping an eye on the situation. "For right now, we are still going out in public. We are still doing things, but if more cases increase, we might change that," Finnigan said. Dr. Dan McGee of Helen DeVos Children’s Hospital in Grand Rapids says babies’ immune systems are not mature enough to have an adequate response to the vaccination. McGee says if a child has been exposed to measles or traveling to a location with the disease, doctors can provide the vaccine at 6 months old. “If you want to bring in your 6-month-old to get the vaccine because you’re scared, the doctor is not going to give it to them. It’s not recommended to give the vaccine unless there has been an exposure,” McGee said.